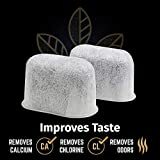 Removes All Kinds of Impurities From Your Coffee That Might Interfere With The Taste of Your Coffee Reduce chlorine taste and odor, select pesticides and chemicals, bacteriostatic. This Increases the lifespan of you cuisinart coffee maker. Made with Premium activated charcoal which has a strong absorption capacity. The Micro-Mesh material ensures the charcoal remains in the filter and does not clog up your Cuisinart coffee maker. UNIVERSALLY COMPATIBLE -- Don't wait to start making great coffee. 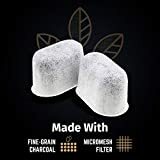 Our replacement charcoal filters are developed to be compatible with any Cuisinart coffee maker model. INTENSIFY TASTE -- All of the nuances of a great cup of coffee start with quality filtered water. Enjoy the ultimate cup of coffee or tea by concentrating on the most important ingredient. 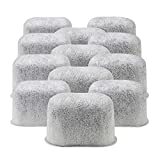 CHOICE MATERIALS -- Our replacement bacteriostatic charcoal filter combines the natural purifying benefits of charcoal with the technology of a micromesh sleeve to remove minerals, calcium, select pesticides, chlorine tastes and odors, to enhance your brewing experience. 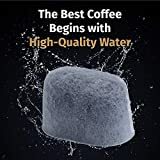 COST EFFECTIVE -- Greater value than any other coffee machine water filter on the market. 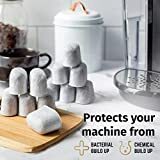 Purchasing our 12 pack of charcoal water filters saves you 6x the amount you would regularly spend on a year's supply. EXTEND PERFORMANCE -- The best filters extend the life of your coffee machine. 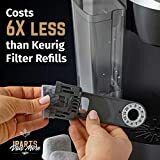 Our 12 pack replacement water filters protect your expensive coffee makers, and you, from harsh chemical and bacterial build up. 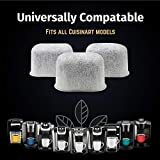 Interested in the 12 Pack Compatible Cuisinarts Charcoal Water Filters Universal Fit By iPartsPlusMore? Is the price too high? You can easily price watch this product and we'll notify you when the price reaches your target.